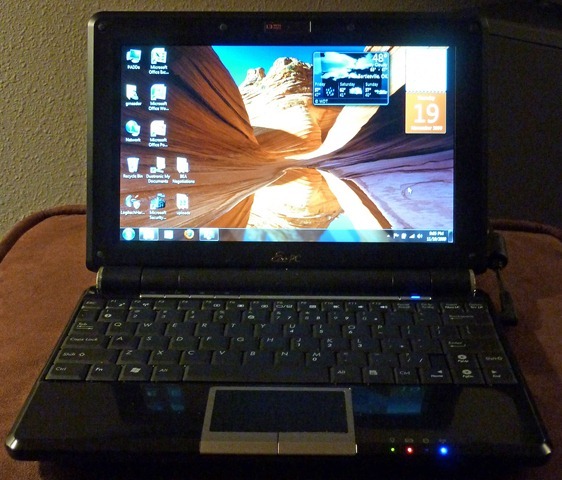 Back in October 2008 I purchased an ASUS Eee PC 1000H netbook as my new portable computer. I dubbed it PADDe, and have been delighted with this little marvel, taking it with me on my Oregon summer vacation and using it around the house and at some of my meetings. I bought PADDe with a hard drive configured for Windows XP and later upgraded its RAM to its maximum of 2 gigabytes. I love how light and portable it is and have been satisified with its battery life of over three hours on a charge. The only drawbacks have been its 1024×600 screen, which I wish were the more standard 1024×768, and its reliance on a touchpad. The diminished vertical resolution forces me to scroll web pages more than I’d like, and I prefer Pointing Sticks to touchpads. I often resort to scrolling pages with the arrow keys since that works more reliably for me. Some months back I bought Presto, a commercial version of the Xandros Linux package, for PADDe. It provides a Linux boot alternative to Windows XP, allowing me to quickly boot up and access the web. But I almost never use Presto since it is so simple to have the netbook “Hibernate” in Windows XP rather than shut down. Hibernation, unlike Stand By mode, doesn’t use any battery power. And it only takes seconds for the machine to wake up from its deep slumber. Windows Vista could never run on the little netbook, since it only has a 1.6 GHz Intel Atom CPU (with a “Super” mode that overclocks it to 1.7 GHz). But I’d read that Windows 7 ran just fine. So I decided I would use one of the three licenses on my Windows 7 Home Premium Upgrade Family Pack to put the latest operating system on PADDe. See below if you want all of the details of this hours-long effort, but the end result is that PADDe is now happily running Windows 7. I love this new operating system and am delighted to now have it on both my desktop and my netbook. Both machines are now in the same “Homegroup”, which is a simplified Windows 7 network. ASUS very kindly posted some instructions and the needed drivers for upgrading their 1000H netbooks to Windows 7 on its support site. I painstakingly downloaded each driver (I wish they had just ZIPped them all up into one archive, but no such luck) and printed out the terse instructions. They just said what to download and gave a brief sequence of driver installations I should trigger with those downloaded files. But they did not say how you get Windows 7 onto a netbook that lacks a DVD drive. I’ve successfully installed Microsoft Office and the Corel WordPerfect Suite onto PADDe by popping their installation DVDs into the drive on my desktop computer and then accessing them on PADDe through the wireless network. But surely that wouldn’t work for installing an operating system – the network connection would be lost during the install. But I’m a regular listener of Paul Thurrott and Leo Laporte’s Windows Weekly podcast, so I knew Paul Thurrott already had the answer. You need to put an image of the Windows 7 installation DVD (called an ISO) on a bootable USB thumbdrive. Microsoft offers Windows 7 online as an “ISO” download, and for awhile included a little utility for copying that image file onto a bootable USB thumb drive. But they goofed on their little utility, creating a licensing problem that led them to yank it off their website, at least for now. Reportedly they will release the source code for the utility to resolve the licensing issues and then I presume they’ll put it back up. But I didn’t want to wait for that nebulous opportunity. Thankfully CNET’s good old download.com still had a copy of the utility. But I lacked an ISO image for the thumbdrive. I already bought the Family Pack of Windows 7 on DVD, and I certainly didn’t want to buy yet another copy online to get the needed ISO image. So, per Paul’s instructions, I downloaded the free utility ImgBurn and used it on my desktop computer to make an ISO image of the 32-bit version of the Windows 7 installation DVD. Then I wiped out one of my eight-gigabyte thumbdrives, using Microsoft’s utility to turn it into a bootable Windows 7 installation device. On a second eight-gigabyte thumbdrive, the amazing Verbatim Tuff ‘n’ Tiny drive , I copied all of the drivers I had downloaded from ASUS. I then stuck both thumbdrives into PADDe while it was running Windows XP and navigated to the \support\migwiz folder on the one with the Windows 7 image. There I ran Windows Easy Transfer, saving PADDe’s existing files and settings to the other “normal” thumbdrive. I don’t have very much loaded onto PADDe, so it fit okay, but if that hadn’t worked I could have sent those items over the wireless network to the desktop for storage. Now it was time for the big plunge – wiping out PADDe’s installation of Windows XP and moving up to 7. ASUS said to use the built-in ASUS Update utility to install the latest BIOS on PADDe. That’s a delicate operation – if you lose power during a BIOS installation you can “brick” your computer so that it won’t boot up, period. So I yanked out the thumbdrives, made sure PADDe had plenty of battery life, and also plugged him into the AC outlet. Then I ran the BIOS upgrade utility and thought I upgraded to the latest BIOS. Later problems would reveal that I had not actually installed the latest version of the BIOS intended for Windows 7 compatibility. But I didn’t realize that at the time. After the new BIOS was installed and PADDe was booted back up into Windows XP, I reinserted the Windows 7 image thumbdrive and rebooted. But PADDe refused to boot off the USB drive – instead only displaying the usual screen to select either Presto or Windows XP. I uninstalled Presto and tried again. Nope – now it just booted into XP. Rebooting again but hitting the F2 key to bring up the BIOS, I realized that a year ago I had disabled the power-on tests and other boot delays to speed things up. So I set those back to normal and tried again. It still wouldn’t boot off the thumbdrive. Another visit to the BIOS revealed that, even though I had it set to boot first off removable media and then try booting off the hard drive, for whatever reason PADDe was reading that USB thumbdrive much like a hard drive. It showed up over in the hard drive settings as the secondary hard drive. So I set it to be the primary hard drive, shifting the real hard drive to the secondary position, and tried again. This time it worked. PADDe slowly booted up off the thumbdrive and finally the Windows 7 installation was underway. The installation itself went like a breeze, although it took long enough that I wandered away, coming back to find PADDe was rebooting and restarting the installation process. I wondered if there had been an error and the installation had aborted or if instead I’d missed instructions to remove the thumbdrive before the computer rebooted. Gambling that the installation had gone fine and a normal reboot had accidentally retriggered the thumbdrive’s installation sequence, I cancelled the installation, yanked out the thumbdrive, and rebooted. I was in luck – Windows 7 booted right up and started updating itself. But while it was clearly running okay, I had none of PADDe’s special netbook features. There was no option to switch from normal speed to overclocking to powersaving and the like. The little buttons that adjust the screen settings, switch the power mode, and start applications with one click were not working. So it was time to start installing the updated drivers I had downloaded from ASUS. I inserted the thumbdrive with the ASUS drivers and went down their list, triggering one driver update after another. Most of them wanted to reboot the computer after installing. I decided to be patient and play it safe, rebooting when prompted. That meant almost a dozen installs and reboots, which got old fast. One driver didn’t work – the SATA AHCI driver referenced a controller that didn’t show up in PADDe’s Device Manager – but I’ve seen no ill effect. The Hotkey Service upgrade, however, triggered a recurrent ACPI error box that reappeared whenever I dismissed it. Hoping a later driver installation might fix this problem, I plowed on down the list. But the final upgrades for the overclocking and BIOS upgrade utilities also generated errors, saying I did not have the right BIOS installed. Scrounging around on the web, I found an upgrade to the ACPI that resolved that annoying error. But I knew something was still amiss with the BIOS. The quandary was that I could not load the ASUS Update utility, which is what you normally use to upgrade the BIOS. Online I found a DOS mode utility for installing the BIOS, but it wouldn’t work under the Windows 7 DOS shell. Other instructions spoke of making a bootable floppy disc with the BIOS update, the way we used to do things back in the dark ages, but that wasn’t an option – my only floppy disc drive is in the old desktop computer. Finally I found instructions to download the latest BIOS version onto the computer and then copy the resulting .ROM file onto a USB drive, then rebooting while striking Shift-F2. That almost worked – PADDe looked for the BIOS upgrade on the USB key, but then complained it couldn’t find ‘1000H.ROM’. Okay – so it insists you give that name to the .ROM file? I renamed the downloaded file on the USB key and that finally worked. The BIOS was now compatible with Windows 7 and I could finally get the ASUS Update utility to install and so forth. But even after all that, I still could not program the special buttons on PADDe. The defaults are okay, except that one just wants to run Skype and I instead use it to start Firefox. Yet another visit to the support forums yielded a copy of the missing utility and I finally had a fully functional netbook running Windows 7. To top things off, I ran the Windows Easy Transfer and it downloaded files and settings off the thumbdrive back onto PADDe. All that was left was to install some missing applications. I stuck an Office 2007 DVD into my desktop computer and installed that onto PADDe over the wireless network. Next will come Corel WordPerfect and a few other programs, and I’m all set. You betcha. Windows 7 is a whopperload better than reliable old XP, and it was worth the struggle to get it working on my little netbook. I haven’t noticed any speed issues and look forward to limiting my time on Windows XP to the machines at work. Knowing how long it takes our district to upgrade our computers, I’ll still be an XP user for years to come, but not at home.